On May 9, South Koreans go to the polls to elect a new president to replace impeached former leader Park Geun-hye. Five candidates have put forward their policy priorities and agendas should they be elected. Whoever wins faces stiff challenges, both domestic and foreign, as Sangsoo Lee outlines below. South Korea faces serious economic challenges, including slowing growth, rising household debt, and structural imbalances. A particular concern is rising socio-economic inequality, with the IMF in 2016 ranking South Korea bottom in terms of income inequality among 22 Asia-Pacific countries. Other issues include redressing the wage gap between regular and non-regular workers, gender occupational inequality, and low social mobility. Many younger people especially complain there are few opportunities to find good jobs without connections or suitable family backgrounds. Furthermore, failing to secure a good job, fewer young people are choosing to marry and have children, leading to stubbornly low birthrates. Indeed, low fertility is a serious challenge to the South Korean economy as it confronts the problem of a greying population. Thus, implementing structural reforms and reducing gaps and divisions is a key challenge for the next administration. South Korea’s Constitutional Court ruled to impeach President Park Geun-hye in March who was dismissed over a corruption scandal. Millions of South Koreans have come out on the streets in recent months to denounce the former president, as well as demonstrate against the murky nexus between political interests and Korean business conglomerates known as chaebol. While the government has undertaken reforms such as enacting anti-corruption law in September 2016 to increase transparency, the next administration will continue to have its work cut out to not only root out corruption from the top levels of South Korean society, but also rebuild low levels of political trust among the population in the government. South Korea suffers from poor air quality which reached record levels in early 2017. While transboundary air pollution caused by desertification and industries in coastal China are largely responsible, South Korea saw its largest increase in C0² emissions this year since the 1990s compared to other OECD countries. In fact, South Korea continues to build new coal plants, with 20 more to be completed by 2029. The consequences include an increase in respiratory diseases and deaths. 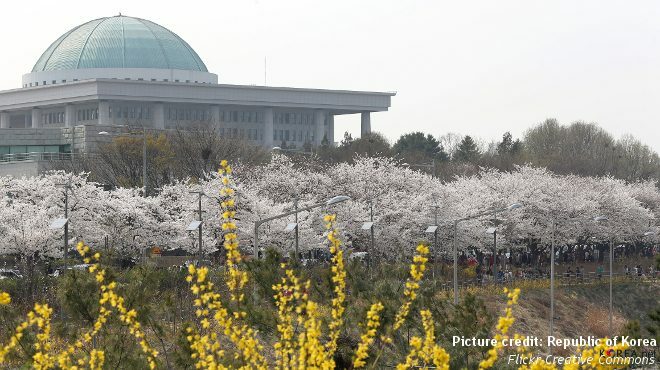 In order to reduce emissions, South Korea is gradually shifting towards nuclear energy. However, there is a lack of safe disposal areas for nuclear waste. Around 9,000 tons, 70 percent of the total, is currently being stored in temporary storage pools which are predicted to reach capacity in 2021. Accordingly, mitigating air pollution and addressing the hazards of its nuclear energy drive will occupy the attentions of the next government. Tensions on the Korean Peninsula have reached crisis levels amidst North Korea’s missile and nuclear tests and the Trump administration’s declared departure from its predecessors’ policy of “strategic patience.” Currently, all dialogue, hotlines, and inter-Korean cooperation projects, including the jointly operated Kaesong Industrial Complex, remain suspended. South Korean society is divided over how to deal with North Korea, with liberals supporting engagement based on economic cooperation and reconciliation and conservatives advocating a more hardline policy focused on deterrence. Nevertheless, the next president comes to power in a context where both approaches over the past decade and more have failed to deter North Korea from pursuing its nuclear ambitions. Its continued development along this path, including recurrent tests, would soon lead to serious question marks over the effectiveness of any re-engagement policy towards North Korea – the approach currently advocated by presidential frontrunner Moon Jae-in. Meanwhile, in the short term, the immediate priority for the next South Korea government should be to urge efforts toward crisis management. South Korea faces an extremely difficult diplomatic environment amid deteriorating relations with its neighbors. The stationing of the U.S. anti-missile system THAAD, while designed to counter North Korea’s missile threat, has angered China which sees it as weakening its own deterrence capabilities. As such, Beijing has retaliated by taking political and economic measures against Seoul. The still unresolved “comfort women” issue with Japan concerning wartime sexual slavery, along with territorial disputes, also put in question bilateral relations with Japan, even as the situation with North Korea also behooves them to cooperate more closely. A seemingly erratic Trump administration also poses question marks over the implications for the U.S.-ROK security alliance, especially if the U.S. should consider military options against North Korea. In any case, demands from the U.S. that South Korea assume a greater role in “burden sharing” by increasing its defense budget, as well as Trump’s stated desire to renegotiate the Korea-U.S. free trade agreement, have introduced frictions in relations. Ultimately, the key challenge for the next government will be to pursue a balanced and communicative foreign policy that emphasizes stable relations with all regional actors rather than with one at the expense of another.